Many thanks to Kerrie and Declan of Olympian Productions for inviting us to participate in the Fleadh, and to all at Luton Irish Forum for their help with tables, setting up etc. It was good to meet up with Dee Corrigan, “Seanchai”/”Storyteller” and Evie and to be part of their day. Thanks also to Gill for all her hard work before and during, as she would tell you, a special day for me. My chance perhaps to stir in others the same interest I had as a child in the beauty of letters. Hoping lots of money was raised for the Keech Hospice, and that we shall be fit enough to repeat the experience next year. A few pictures here of our day. 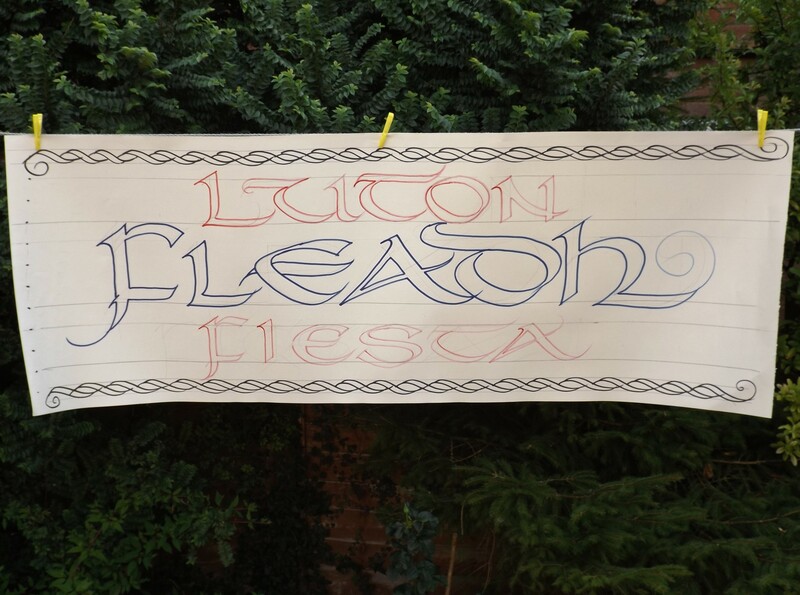 Luton Irish Forum Calligraphy Group, meet every Tuesday evening 7.00 – 9.00 pm, and Friday afternoon, 2.30 – 4.30 pm. All welcome, only £1.00 donation per session. This entry was posted in Uncategorized and tagged calligraphy, Education, Fleadh Fiesta, Irish, uncial. Bookmark the permalink.